Provide Effective Solutions for Managing and Mitigating Surface and Airborne Dust at Active Points. It is a known fact that not all dust control solutions involve the use of chemicals particularly when the source of that dust is as a result of rock crushing and screening operations in mining and materials processing as well as from conveyor and transfer points. To try to combat dust emissions and fallout with chemicals in these applications would prove uneconomical and the volume required if treated chemically would be substantial. Soil Solutions® has consulted with numerous clients and as a result of the overwhelming demand to reduce dust fallout from these types of operations we have once again delivered the optimal solution. 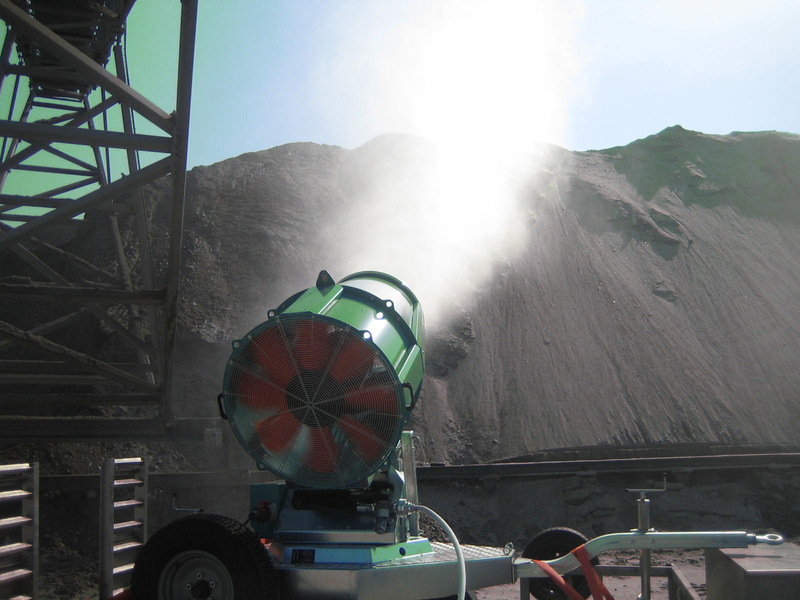 The Industrial Dust Machine (IDM) is the most advanced and powerful force against dust emissions and airborne dust fallout generated by rock crushing, screening, conveyor and transfer points and active stockpiles by delivering a matchless ability to manage and mitigate dust fallout which can be attributed to its standalone technology. The IDM produces micro-mist particles of water that trap dust particles in the air and guide them back to the ground and is a cost efficient way of managing dust fallout that is of inestimable value to construction sites, demolition areas, landfills, mining and quarrying operations, recycling and scrap yards, concrete and aggregate operations, stockpiles, steel and slag piles, conveyer belts, tipping transfer points and shipping ports. In addition to being capable of suppressing dust and odor over vast areas, the versatility of the IDM machines is impressive due to their mobility, reach and adjustable water consumption. IDM machines are mounted on a trailer and can be transported and positioned exactly as and when needed as well as be programmed to oscillate to further increase coverage. External Generator packages are available for remote or difficult access points. The IDM options range from the IDM Nano, IDM Maxi and IDM Major. IDM Industrial Dust Machines – Another Engineered Solution from Soil Solutions® ….Consider it Solved. The IDM Maxi is ideal for outdoor work.